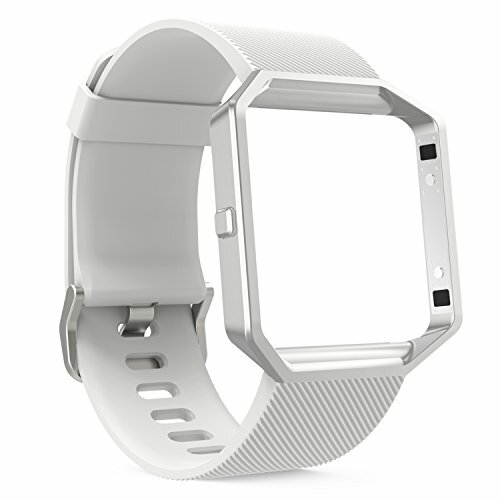 Custom designed for your precious Fitbit Blaze Smart Fitness Watch, this MoKo Noble Frame Housing + Soft Silicone Fitbit Watch Band features a combination of functionality and style. * Personalized Your Fitbit Blaze Smart Fitness Watch with this refined replacement frame housing + soft silicone wristband. * Made of premium soft material, breathable and comfortable, will not irritate your wrist. * Superior quality stainless steel frame, easy to install and remove, fit for your Fitbit Blaze well. * High quality stainless steel buckle and silicone fastener ring to protect your bands from dropping. * Precise multiple holes for you to adjust your band easily. You don't need to worry about the improper size. * Fits 5.71"-8.67" (145mm-220mm) wrist. COMPATIBILITY - Personalized your Fitbit Blaze Smart Fitness Watch with this refined replacement frame housing + soft silicone wristband. PREMIUM MATERIAL - Made of soft and breathable elastic silicone, comfortable for sporting time. A superior quality stainless steel frame, easy to remove and intall and fit for your Fitbit Blaze well, nice replacement for your lost or damaged bracelet. ADJUSTABLE DESIGN - Precise multiple holes design for you to adjust the bracelet to a suitable length easily. You don't need to worry about the improper size. SUPERIOR PROTECTION - Equipped with a stainless steel buckle and silicone fastener ring, perfect protect your fitness tracker from dropping while outdoor sports or daily working. SIZE OPTION - Fits 5.71"-8.67" (145mm-220mm) wrist. Please measure before purchasing. Accessories ONLY, watch NOT INCLUDE.